This make us smell a gaming PC graphic cards with 12GB of video memory soon, AMD today announced a 12GB GDDR5 workstation graphic card for professional uses, the FirePro S10000 12GB edition, will be available later this year. With full support for PCI Express 3.0 and optimized for use with the OpenCL compute programming language, the AMD FirePro S10000 12 GB Edition GPU features ECC memory plus DirectGMA support allowing developers working with large models and assemblies to take advantage of the massively parallel processing capabilities of AMD GPUs based on the latest AMD Graphics Core Next (GCN) architecture. 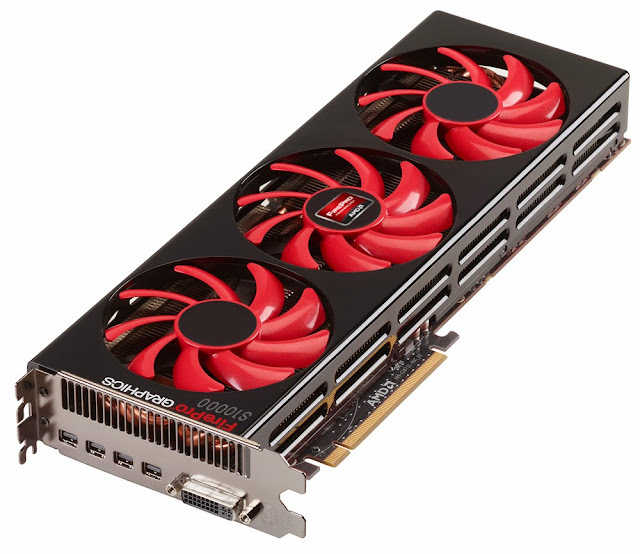 AMD FirePro S10000 12 GB Edition GPU is slated for availability in Spring 2014. "Our compute application customers asked for a solution that offers increased memory to support larger data sets as they create new products and services," said David Cummings, senior director and general manager, Professional Graphics, AMD. "In response, we're announcing the AMD FirePro S10000 12 GB Edition graphics card to meet that additional memory demand with support for OpenCL and high-end compute and graphics technologies." "AMD is proving again to be a key player in providing outstanding 3D graphics and GPGPU compute solutions based on the OpenCL Khronos Group standard for the industry with the announcement of the new AMD FirePro S10000 12 GB graphics card," said Nicolas Duny, VP R&D Technologies, Dassault Systèmes. "AMD is an industry innovator by responding to our customers' needs with cutting edge technology. The AMD FirePro S10000 12 GB card will be a welcome addition to the market and to our customers." "Our customers are always eager for additional memory, so the introduction of the AMD FirePro S10000 12 GB Edition graphics card means key applications will finally be able to take advantage of the graphics compute capabilities," said Laurent Bertaux, CEO, CAPS. "As a leading provider of software and solutions for the HPC community, CAPS recognizes that this is a great opportunity for customers to reduce the potential for the bottleneck of data transfer, thus improving overall application performance. CAPS is a long-time AMD supporter so we're pleased that CAPS FORTAN and C compilers for OpenCL can immediately make full use of the 12GB memory offered in this new AMD FirePro solution." The current AMD FirePro S10000 graphics solution with 6 GB of GDDR5 memory has received great acclaim. For example, the University of Frankfurt's Institution of Advanced Studies use of the card with the SANAM supercomputer ranks in the top five on the Green500 List as one of the most powerful and energy-efficient supercomputers powered by graphics processors. HP 2000 Wifi driver Windows 7/8 "Atheros AR5B97"
Gran Turismo 7 PS4 release date in 2014 ?